He was the first racer to win five editions of the Giro d'Italia, and three times the Road World Championships. Also he won Milan–San Remo twice, and the Tour of Lombardy four times. His name is connected to two local professional road bicycle racing event: the Trofeo Alfredo Binda, a women's professional road race held annually in the Municipality of Cittiglio in the Province of Varese and Tre Valli Varesine, a classic European race held annually in Varese for professionals and organised by tle local club Alfredo Binda. Alfredo Binda was the only cyclist in the world who was paid to stop riding. It happened in 1930 for not competing in the Giro d’Italia, that he won in the previous 1925, 1927, 1928,1929 editions. In order to persuade him to stay home at his the village of Cittiglio (where he was born in 1902), he was given 22.500 Lira ( approx.11,600 Euro). In that period, this amount of money represented a fortune that he wisely invested in real properties in Milan. This sum was given him by the newspaper Gazzetta dello Sport. He would have won the fifth Giro d'Italia in 1933, setting up a record of successes that only two champions like Fausto Coppi and Eddy Merckx later equalled). His talent in cycling blossomed in Côte d’Azur, where he lived with his relatives and was sent to work as plasterer. He revealed himself to be an extraordinary talent, who could run up 114 successes. Among these wins: four Road Italian Championships, four Tours of Lombardy, two Milan-Sanremo, three Road World Championships (a record later equalled by Rik Van Steenbergen, Eddy Merckx, Óscar Freire and Peter Sagan). 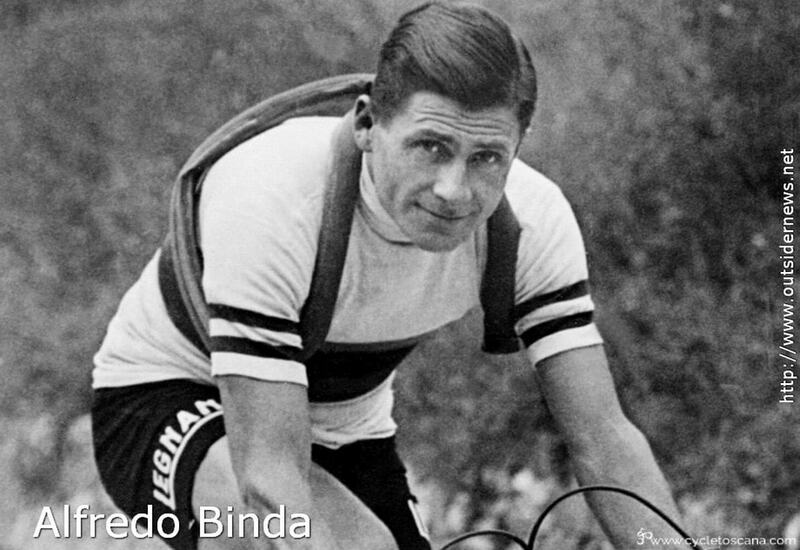 Alfredo Binda was an all-round athlete, with a perfect style when riding. He also held the Italian hour record (43.777 Km), that he got in Milan. His career ended in 1935. He was a man with great composure and extraordinary technical competences. As manager trainer, he led Bartali (in 1948), Coppi (in 1949 and ’52) and Nencini (in 1957) towards victory during the Tour de France. Thanks to his wary guide, also Coppi and Baldini won hands down the World Championships of Lugano (in 1953) and Reims (in 1958). Alfredo Binda, who had been the protagonist of the great cycling for sixty years, died in 1986. In 1909 Luigi Ganna put the seal of Varese to the first edition of the Giro d'Italia. He was born in the village of Induno Olona close to varese in 1883 and was the ninth of ten children. Ever since he was a child he fell in love with bicycle. When he was a young mason, he used to commute the yard from Induno to Milan by bicycle: 110 kilometres, of course without turning a hair. After three years of very good training, which allowed him to mature slowly but constantly, he won the Milan-Sanremo in 1909 and the first edition of the Giro d'Italia in 1909. He was a long distance cyclist. He wasn't a sprinter. This costed him several wins. 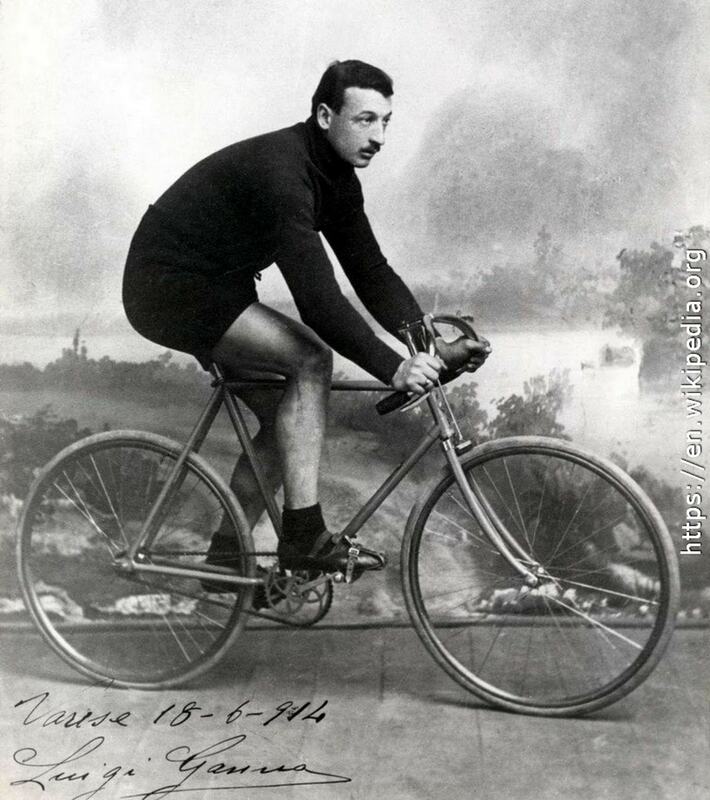 His last success was the so called Gran Fondo Milan-Milan in 1912. In the same year he took his first steps as craftsman-entrepreneur. He managed a bike shop in Varese. Three years later he started a company for the production of bicycles in Varese and a pro cycling team. After the First World War he started producing motorbikes, but without betraying his love for the bicycle. During the 50s the cycling team of luigi Ganna was captained by Fiorenzo Magni . Magni remembers Ganna as a man with an extraordinary good sense and humanity. Luigi Ganna died in 1957.